"Don’t Walk 22 Miles in Wahlberg’s Shoes in This Story"
MILE 22 is a high-octane thriller starring Mark Wahlberg as James Silva, a highly-trained, brilliant paramilitary operative trying to protect an asset with valuable information about a major attack. MILE 22 has very intense moments, but bad writing leaves viewers wanting more. The worldview has some positive some elements, but also some immoral ideas, gruesome violence and abundant foul language that warrant extreme caution. MILE 22 is a high-octane thriller starring Mark Wahlberg as James Silva, a highly-trained, brilliant paramilitary operative trying to protect an asset with valuable information about a major attack. The opening credits reveal that Silva is mentally unstable and prone to violent outbursts, but extremely intelligent. Serving in the military and CIA, Silva now is a part of a top-secret tactical team that’s aided by a remote team called Overwatch, who keep an eagle eye view on Silva’s operatives, protecting them and keeping them on target. The opening scenes shows Silva’s operatives and Overwatch in action as they infiltrate a KGB safehouse in the United States and kill everyone involved. Eighteen months later, Silva and his guys are in a corrupt and dangerous Southeast Asian country looking for a deadly compound that could set off the worst terrorist attacks in history. On Silva’s team is Alice, an equally hot-tempered operative grappling with a divorce and trying to maintain a relationship with her daughter now that she’s a secret agent. Out of the blue, a local cop, Li Noor, approaches the US Embassy with a hard drive, saying he knows exactly where the explosives are that Silva is hunting. The locations are on the hard drive, but if they don’t get him out of the country with Asylum to the US in eight hours, the drive will erase itself and they’ll get nothing. Silva and Alice at first refuse to give Li anything, but then two men try to kill Li while he’s in their custody at the embassy, and they realize that the country hosting them will do anything to silence Li. To extract Li from the country, Silva’s superior enacts the Overwatch protocol, where Silva and his team are officially fired from the government and become ghosts to avoid any blowback on the US government. The remote Overwatch team is assembled, and Silva and his team of deadly men and women are sent out with Li. All they have to do is travel 22 miles through the city to an airport strip where a military plane is waiting. Getting there will prove more difficult and more deadly than they imagined. Once MILE 22 gets going, the action and intensity never cease. 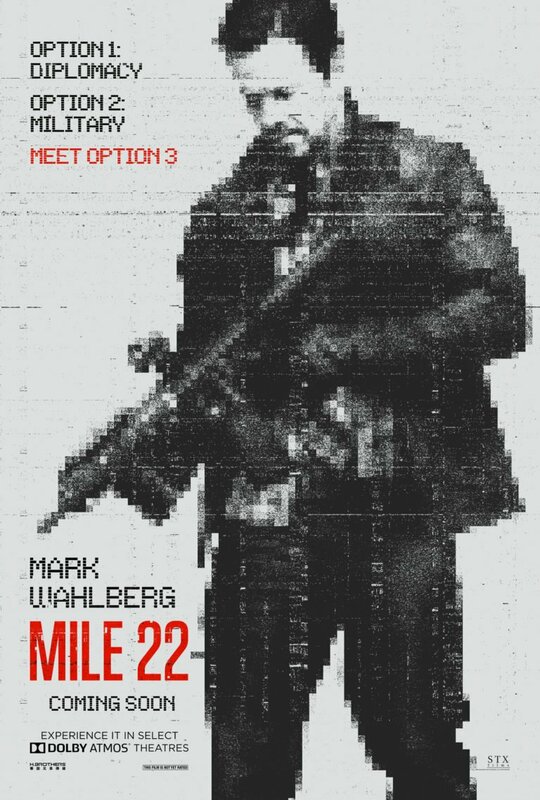 Director Peter Berg makes MILE 22 his fourth collaboration with Wahlberg (LONE SURVIVOR, PATRIOTS DAY, and DEEPWATER HORRIZON), and it’s by far their most brutal and morally gray movie. Wahlberg consistently plays intense, prone to anger characters, and Silva is all that many times over. However, he stays a single faceted character, and viewers never really see a human side to him. At one point, he shows he cares for the lives of innocent civilians, even if they’re not American. Also, though he’s ready to leave some of his injured soldiers behind to die, he eventually goes out of his way to save Alice. As for the movie’s morally grey worldview, the Overwatch head, played by John Malkovich, at one point calls their service a “higher form of patriotism,” because these guys will do what no one else will. All of this begs the question, how much is too much? While the movie makes no judgments about the types of operations these agents must perform, it presents some glimpses of the moral lines these soldiers care about, such as protecting random children in the street who could get caught in a crossfire. Otherwise, however, virtually anything else goes for the sake of protecting national security. In one scene, Silva comments to a frustrated Alice about how many people they’ve killed. “You should try that Jesus guy,” Silva says “I hear he’s really forgiving.” Clearly, for the heroes in this story, Jesus is out of the question. Silva believes that sometimes you need heroes who do bad things for good reasons. It’s a flawed, and unbiblical, worldview, but it’s also disconnected from the rest of the story, since they spend the entire plot trying to save someone and all of the killing that happens is in self-defense. From a viewing perspective, MILE 22 is overly violent and almost relishes in some of the gruesome ways bad guys are killed. There’s also abundant foul language throughout that makes this movie inappropriate for teenagers and warrants extreme caution for adults. MILE 22 is a high-octane thriller. It stars starring Mark Wahlberg as James Silva, a highly-trained, brilliant paramilitary operative trying to protect an asset with valuable information. Working in a Southeast Asian country to find some deadly explosives, the man turns himself over to the Americans saying he knows exactly where the explosives are. However, he’ll only give the intel if the American agents get him to the United States alive. This means Silva will have to enact a top-secret operation to move the informant 22 miles to an airstrip, while an army of goons try to kill them. Once MILE 22 gets going, the action and intensity never cease. A major problem is the movie’s writing and structure. There’s no climax. The movie builds to what could have been an epic showdown, but instead leaves that showdown for a sequel. MILE 22 has some moral moments of protecting innocent lives, but there’s a message it’s okay to give up morals for the greater good. This is where the movie becomes problematic. Excessive violence and abundant foul language warrant extreme caution for MILE 22.